Due to the nature of digital pattern sales, I cannot issue refunds for pattern purchases. The only exceptions to this are accidental duplicate purchases. Want to sell bags made using my patterns? I have no restrictions on sale of finished bags that you have hand-made. I only ask that you please make reference to "Cloudsplitter Bags" in any online listings or postings. 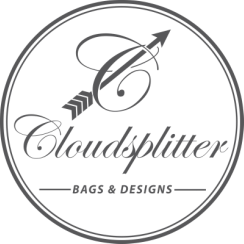 All patterns on this site are original Cloudsplitter Bags designs, and are not to be copied, distributed, or passed off as ones own.